Taking your dog for a trip in the car, short or long, can be an adventure. But the idea is for the adventure to happen once you get to your destination, not because of drama on the trip. There are a number of things you can do to make your car trips more pleasant and less stressful for you and your pup. Lots of people let their dogs roam free in a moving car. But years ago, parents let their children roam free in moving cars, too. Now, seatbelts are required because they’re life-saving devices. Your dog is a lot like a small child loose in the car. In the event of an accident, there’s a good chance that you can’t grab a dog or a child fast enough to prevent an injury. Slamming into the dashboard or the windshield, or even the backs of the front seats, can cause injury or death. Don’t risk it. Invest in a quality dog seat belt restraint. 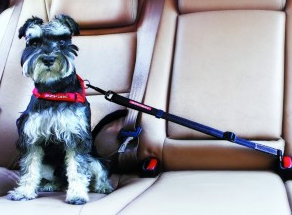 EzyDog offers restraints that let you choose between slipping the seatbelt through the restraint or buckling it into the seatbelt receiver directly. Both are designed to allow your dog comfort and freedom of movement while keeping him from roaming all over the car. That makes him safer, and it makes you safer. You don’t have to worry about being distracted by a dog that might try to climb in your lap or wind around your feet. 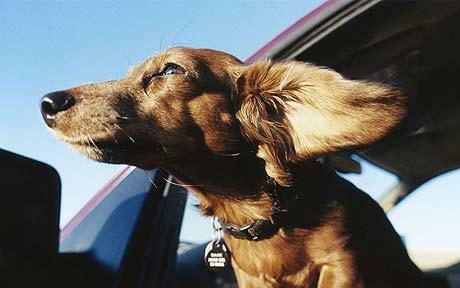 Having a window down for some fresh air is enjoyable for everyone in a car, including your dog. But as much as they seem to love hanging their heads out a window, you should make sure your dog can’t get his head outside. This can cause injury from being struck by something as simple as a bug, and can cause serious problems if the dog tries to jump out or even falls through the opening. It’s simply not worth the risk. Also, when you use your dog seat belt restraint, do so in the back seat. This is especially important for cars that have air bags on the front passenger side, as most do today. For the same reason small children need to be in the back, so does your dog. The impact from a deploying airbag can be fatal for animals as well as children. Avoid letting your dog eat for a little while before the trip. Feeding him on route is probably not a good idea, either. Many dogs get sick in cars. While it’s much like motion sickness in people and will go away after he’s out of the car, there’s no point in your dog feeling badly or you having to clean a mess. Feed your dog after you’ve arrived, and remove food and water for 30 minutes or so before the return to trip to keep his stomach calm.